Huge Savings Item! Free Shipping Included! 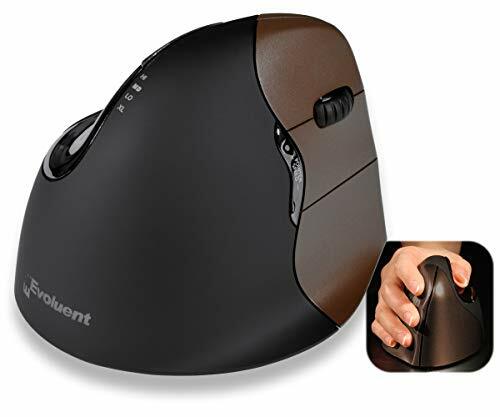 Save 11% on the Evoluent VM4SW VerticalMouse 4 Right Hand Ergonomic Mouse with Wireless Connection (Small Size) by Evoluent at Andy Pemberton. MPN: VM4SW. Hurry! Limited time offer. Offer valid only while supplies last. Evoluent vertical mouse 4 small wireless VM4SW 632. Connection type: wireless. Movement detection: optical. Movement resolution: 2600 DPI. Evoluent vertical mouse 4 small wireless VM4SW 632. Connection type: wireless. Movement detection: optical. Movement resolution: 2600 DPI. Ergonomic. PROGRAM YOUR MOUSE TO YOUR NEEDS - Install the Evoluent Mouse Manager onto your computer to configure the VerticalMouse's buttons. Not only can you change their function but you can also set how the buttons work within different programs. ADJUST MOUSE-SPEED FROM LOW TO HIGH - You can adjust the pointer speed from low to high with the optical sensor controls on the side of the mouse. There is no need to release the grip for speed adjustment. OFFERS OPTIMUM COMFORT - The VerticalMouse 4 has a broader lip along the bottom edge that prevents the pinky finger from rubbing the desk. The thumb has been reshaped from earlier version to provide more comfort. WIDE RANGE OF WIRELESS COMPATIBILITY - Wireless connectivity via Mini Receiver. The tiny 2.4 GHz receiver avoids being knocked off the side of a notebook computer and is compatible with Windows XP, 7, 8 and 10, Mac and Linux Systems. If you have any questions about this product by Evoluent, contact us by completing and submitting the form below. If you are looking for a specif part number, please include it with your message.